Afghan Quran-burning protests: What’s the right way to dispose of a Quran? What’s the right way to dispose of a Quran—or any other sacred text? Violent protests have raged outside Bagram Air Force Base in Afghanistan for two days after local workers found the burned remains of more than 100 Qurans in a pile of garbage from the base. What’s the proper way to dispose of a Quran? Bury it, erase it, or store it indefinitely. The Quran does not include instructions for its own disposal, and Mohammed never appears to have addressed the issue. Islamic scholars, however, offer several options. According to a recent essay by Jonas Svensson, a Swedish professor of Islamic studies, the most venerable method seems to be to wrap the text in cloth and store it indefinitely in a safe place. During the 1972 renovation of an ancient mosque in Yemen, workers found piles of parchment—presumably unwanted holy texts—dating to the seventh century. Similar discoveries have been made in mosques in Tunisia and Syria. Today, Muslims in some areas, such as Quetta, Pakistan, place their linen-swaddled Qurans in caves dug into the side of rock quarries. Ritual burial is another widely accepted practice. The grave should be in a holy place, such as the grounds of a mosque or a Muslim cemetery, where the book won’t be trampled upon. As in the case of storage, the Quran should be wrapped in cloth—often linen, but there’s no requirement—to protect it from impure soil. The most fastidious scholars demand that Muslims place the book in a niche dug into the side of the grave, oriented toward Mecca. A less common practice is to desanctify the book by removing the text from its pages. Some medieval scholars recommended wiping off the ink and disposing of the paper by ordinary means. A more modern and practical alternative is to tie the book to a stone, then drop it into a stream to symbolically achieve the same effect. Burning isn’t a popular choice, because fire is associated with the devil as well as the early rival religion Zoroastrianism, but some scholars find it acceptable. Saudi religious authorities place burning on par with burial, as long as it’s done ritually on mosque property. They point out that Uthman ibn Affan, a friend to the prophet and early caliph, sanctioned the burning of nonconforming Qurans after compiling the official version. Other scholars view burning as a last resort, for example, in an emergency situation to prevent the book from being defiled. After burning, the ashes should be buried or scattered over water. Quran-handling regulations extend far beyond disposal. 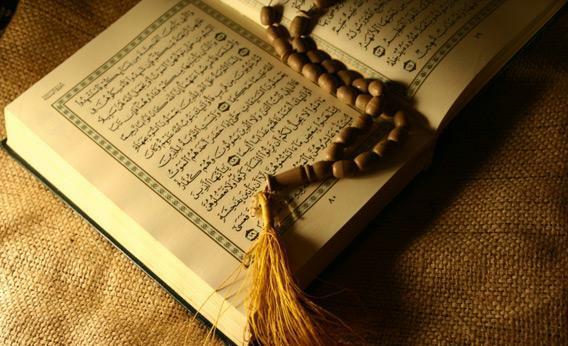 Depending on their chosen sect, Muslims are forbidden to touch the Quran during menstruation, allow the book to touch the ground, leave it open after reading, use it as a pillow, or take it into impure places such as the bathroom. (As with any religious mandate, not all Muslims adhere to these rules, even if they acknowledge their legitimacy.) The physical text of the Quran is considered not just sacred, but also mystical and powerful. Some Muslims wear verses as amulets for protection or dissolve ink from a Quran in water and drink it to cure illnesses. Other religions may not imbue their holy texts with quite the same degree of sanctity, but most have rituals for disposal. Many Jewish authorities require the faithful to place sacred writings into a repository to await mass ritual burial. For some, the dictum goes beyond the Torah itself to include any text containing the name of God or brief quotations from the holy book. A common disposal method in Hinduism—though it is a vast religion with widely varying rituals—is to consign the Mahabharata or other sacred text to a holy river such as the Yamuna or the Ganges after a brief prayer. Christianity is somewhat unique in that it has no long-standing rituals for disposing of worn-out holy texts. Recently, however, some Christians have adopted practices from other religions, such as a respectful burial. Explainer thanks D. Max Moerman of Barnard College, Jonas Svensson of Linnaeus University, and James Watts of Syracuse University. Video Explainer: Did cavemen eat vegetables?